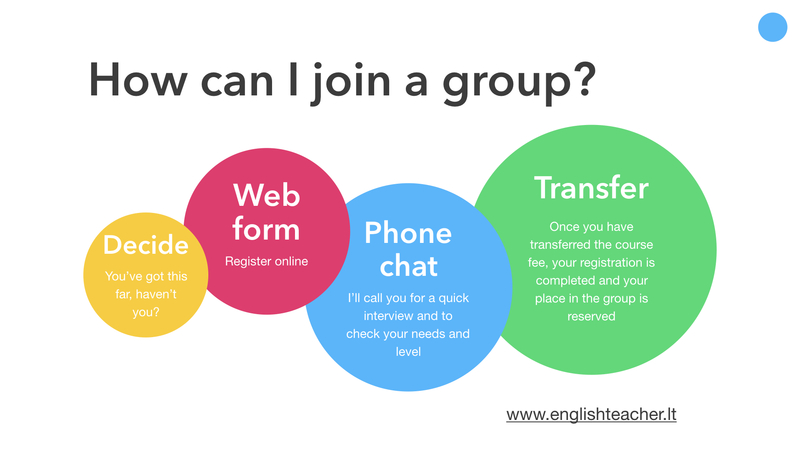 Conversation groups are recommended for people who would like to improve their fluency and vocabulary. Why have I designed this course? Having lived here in Vilnius a while, I've noticed that people in Lithuania tend to have good passive knowledge of grammatical structures. Maybe that's you? You do well in so-called "level tests" when you have to select one correct answer in a multiple-guess (sorry, choice) test. But you struggle to maintain a conversation during a coffee break. You can't apply your English when you need to. You lack the words you need to express your ideas. Or you simply suffer from low confidence when speaking. In short, you don't get enough practice. You know that your English used to be better; it's got worse because you simply don't use it enough. This course is designed to provide a supportive atmosphere to boost your spoken fluency, vocabulary, and confidence. We will take various themes and I will design activities to get you talking. You can expect to work in pairs and small groups. 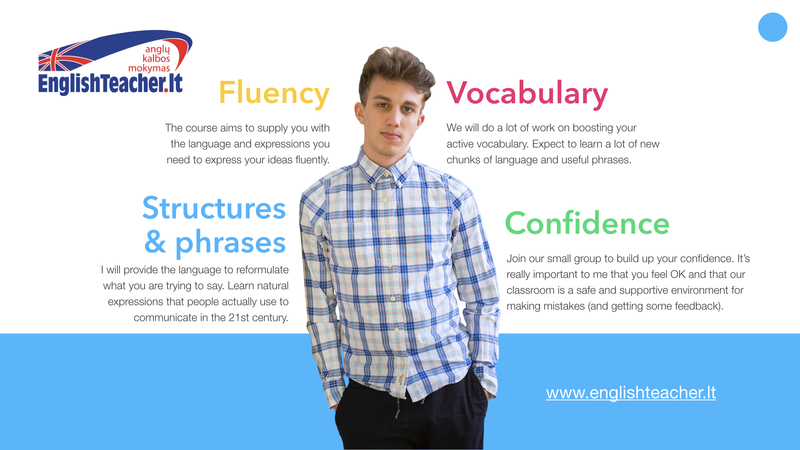 As the teacher, I will provide correct models of language, helping you to express you ideas accurately. 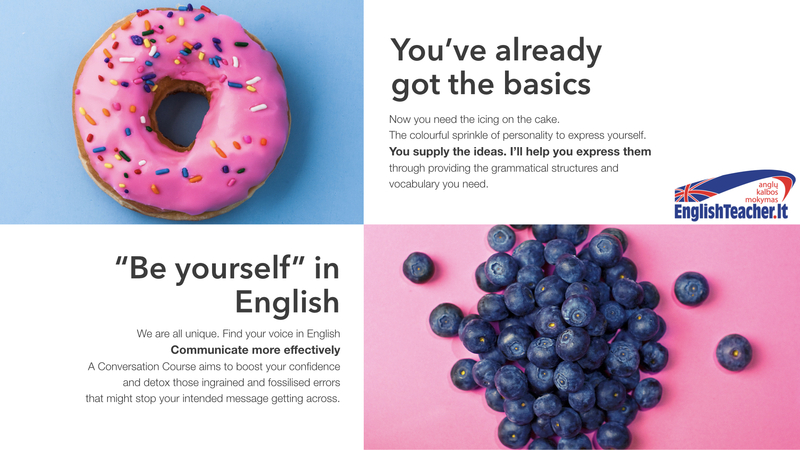 With continuous feedback and reformulation, and by providing you with a wealth of language (phrases/expressions), hopefully you will feel that you are making progress. I've chosen to make Vilnius my home. I've lived here a while, so I "have some inkling as to"* what you find difficult about speaking English. I reckon I'll have a fair idea of the errors you are likely to make and why. Yes, I understand Lithuanian, although I will encourage you not to rely on this and to help you make use of coping strategies and the power of paraphrasing. 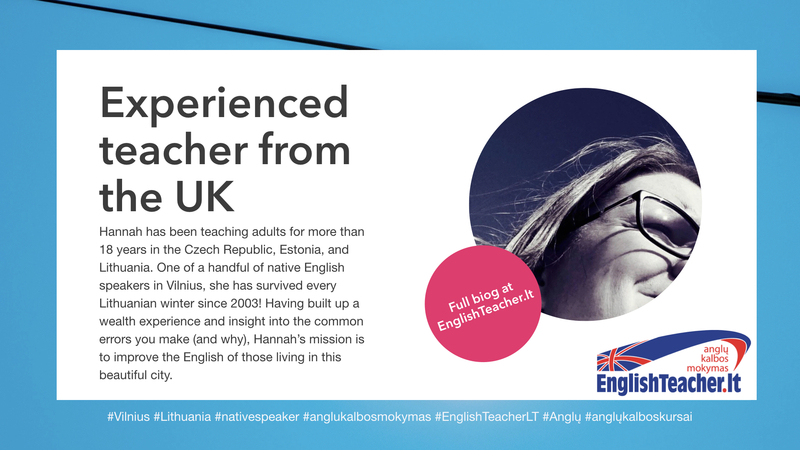 So, if you want to practise English and build on what you know, join us for the next Conversation Course. Register here or SMS 868547780 (I'm often in class, so send a message with your name and 'Conversation' and I'll call you back). "But I don't know English grammar!" - There is very little systematic grammar input on these short courses because the focus is on communication. Instead, you will be corrected if you make a mistake. If you expect a more thorough approach, choose a General English course instead. Topics include: Health, Crime, Politics, Current Affairs, Ethics, Sport, Business, Lithuanian food and culture + your ideas/random requests! "I'm shy" - this doesn't matter. My mission is to get you speaking! However, students in these groups should be willing to try and speak and contribute to discussions. You will not break down the language barrier unless you make an effort you join in - I can't help you unless you try. So get stuck in and join a group today.